Larger roof installations often lack of maintenance because of complicated access. Those larger installations can be flown over and analysed with a drone. The drone is an electrically operated flying machine with a take-off weight of less than 5 kg that is controlled from the ground. The professional use of drones by GPS control allows to take aerial photos and thermal images for photovoltaic systems at the optimum angle for a relatively short flight time. The shading can be very well recognized and calculated for further simulation. 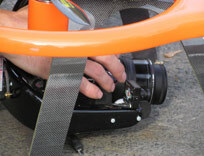 Data report can be managed by the central control on the ground – as a film or a photo, depending on the application. Especially with thermographic images it is necessary to use large lifting platforms in most of the cases. 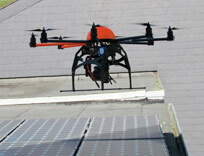 If so, the drone offers a cheaper and considerably more convenient alternative to the use of those lifting platforms. The drone is a professional addition to a comprehensive situation assessment. However it cannot replace "visual observation" and certain measurement values, but the enthusiasm generated by working with this flying technology cannot be dismissed either. Prior agreements from the owner and regulatory approval are required. The drone is not a toy. A commercial approval by the manufacturer has to be regarded. The safety of the airspace is very important in this kind of testing. Pictures cannot be taken in strong wind or rain. Location determination of large and inaccessible outdoor surfaces can be done with a UAV (Unmanned Aerial Vehicle). This is most suitable depending from a size of about 5 ha to 10 ha. Herewith we can get a 3D image. 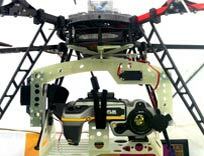 Furthermore, the first flight is performed with a high resolution Thermal Imaging Camera. 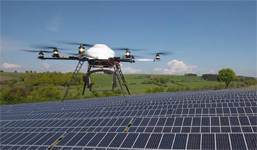 Smaller solar parks are flown with the copter.